R. Frouin, H. Murakami, Estimating photosynthetically available radiation at the ocean sruface from ADEOS-II global imager data, J. Oceanography, 63, 493-503, 2007. N. Saigusa, K. Ichii, H. Murakami, R. Hirata, J. Asanuma, H. Den, S.-J. 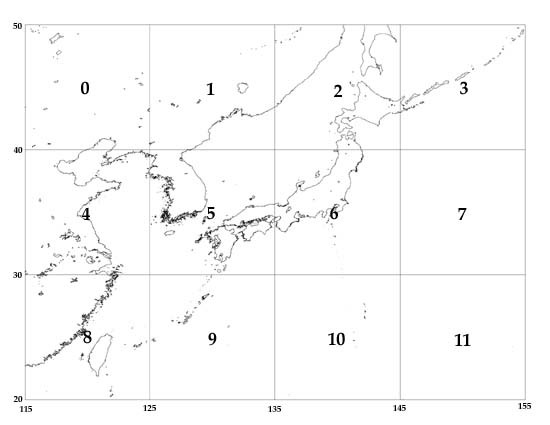 Han, R. Ide, S.-G. Li, T. Ohta, T.Sasai, S.-Q.Wang, G.-R. Yu, Impact of meteorological anomalies in the 2003 summer on gross primary Productivity in East Asia, Biogeosciences, Vol 7,641-655, 2010. Copyright @2013 Japan Aerospace Exploration Agency, Earth Observation Research Center All rights reserved.